Spain’s fourth mobile network operator, Yoigo, has been sold by its parent company Telia to Spanish telco Masmovil to create a multiplay challenger. 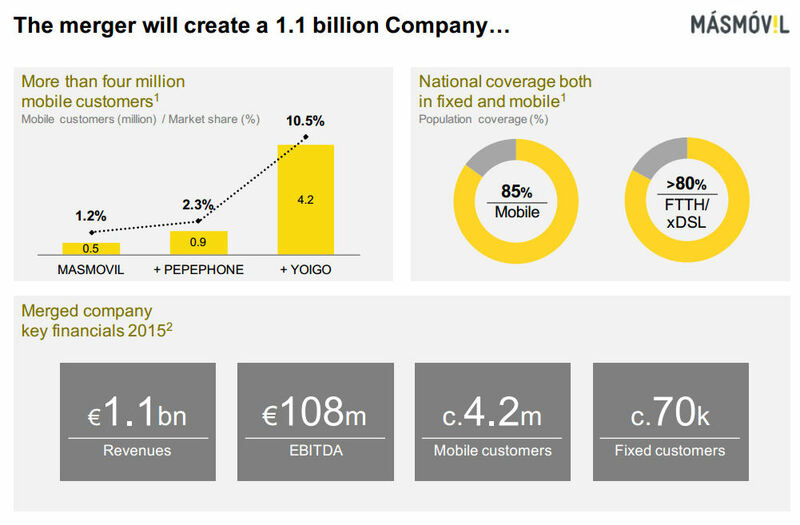 Swedish telecoms group Telia actually owned 76.6% of Yoigo, and Masmovil has acquired the remainder of the company for a total enterprise value of €612 million. Telia had been looking to exit the Spanish market for a while and entered into talks with UK investment group Zegona earlier this year, which also owns Spanish cableco Telecable, but it looks like they were gazumped by Masmovil. The main stated reason for the acquisition was to consolidate fourth position in Spain. Masmovil started as an MVNO on the Orange network in Spain. In April of this year it acquired Pepephone to double its mobile subscriber base to around a million, but this move adds another 3.3 million mobile subscribers to its nascent nationwide fixed-line operation. In the Spanish language press release Masmovil CEO Meinrad Spenger said the two acquisitions consolidate his company’s position as the fourth convergent telco in Spain, with 4.2 million mobile customers and around 70,000 broadband ones. He added that the deal is good for Spanish businesses and consumers thanks to Masmovil’s attractive prices. The Spanish mobile market is dominated by the big three of Movistar (Telefónica), Orange and Vodafone, which together account for 85% of Spanish mobile subscribers, according to Ovum’s WCIS. Masmovile and Zegona both clearly believe there is room for a fourth challenger player, with an emphasis on multiply. As recently as yesterday Zegona told its shareholders it was still engaged in the process, despite having been out-bid by Masmovil.